This time I am blogging from my parents place in the Netherlands. Such a blessing to be able to spend Christmas with my family at home. Even though I love my life in Sweden, and we always feel sad about not having a white Christmas in Holland, it is great to be back for a little while. Many of the international students chose to go back over the holidays. Actually, many Swedes do the same. For Swedish students whose parents are living up North or down South the journey can be as long and expensive as my own travels! Therefore there are quite some Swedish students who haven’t seen their families since summer holidays either. I’d say there aren’t many students left in Uppsala during Christmas, but I know that the ones staying behind usually have a wonderful time as well. At least the city looks very merry with all the lights out on the streets. Many Swedish families put these traditional advent candles behind their windows, which looks very cosy from outside. 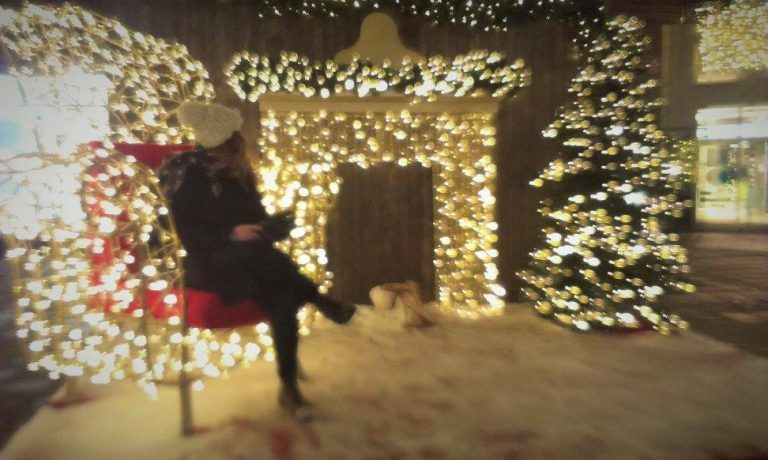 I didn’t really know about advent before moving to Sweden. Advent originates from the Latin word Adventus which translates to ‘coming’. Four weeks before Christmas the advent starts and the sundays before are called the first, second and third advent, and the fourth advent takes place on the 24th of December. Advent is originally a Christian tradition, but I have the feeling that it became more of a cultural tradition rather than a religious one in Sweden. To Swedes these advent sundays seem to be the perfect excuse for extra luxurious fikas 😉 The advent fika comes with another delicious pastry named pepparkakor combined with glögg, a mulled wine. Another tradition I adore is the start of a children show on television on the first advent: The Julkalendern. From this day, until Christmas, every night there will be a short episode of about ten minutes broadcasted on television. Obviously the stories have been made for kids, but a lot of my Swedish friends have never stopped watching it since they were young. My roommates – two guys in their mid twenties – have been faithfully watching every day and were also arguing which of the series they loved most of the past years. I still have some catching up to do, but I watched the start and it looked very nice, a little mysterious. A great way to practice your Swedish! You can find the trailer below. God Jul allihoppa! This post is the last one in a mini-series named ‘Into the Arctic’, you might want to read part 1 and part 2 first. 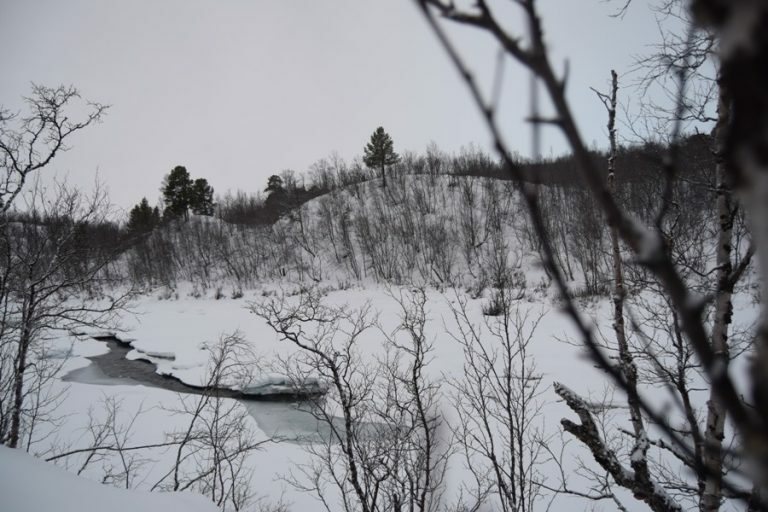 The second and final destination for us to stay was the National park of Abisko. An unique nature reserve and one of the most famous places to watch the northern lights. Or as the sky station of Abisko puts it ‘Abisko, in the middle of the auroral zone, is considered to be the best place on earth to see the Aurora Borealis. With its fresh, clear air and its practically permanent cloud-free sky the prerequisites in Abisko a re optimal. More or less active northern lights can be seen almost every night.‘ Creates some expectations, doesn’t it? Unfortunately, both nights we spent in Abisko were so cloudy we couldn’t see any aurora, even though there was a lot of activity. A bit disappointing, but Abisko itself was still very impressive. With a small group of friends we went on a morning hike along the riverside. The track was marked well, but the thick layer of snow was from time to time quite a challenge. It was stunning. And the quietness of the place was wonderful. It was a lot of fun to let yourself fall down in the snow. We didn’t see many animals on the way, but we did see lots of funny tracks and surprisingly quite some insects. Who would have thought? In Narvik we went out for a photostop and were finally dropped of in town. Here we all went together on a hike up the hill, which was extremely slippery. Me and some friends were betting on how many people we thought would slip and fall, but none of us expected these amounts of us to go down – it was crazy. I was really lucky though, as I had brought my ‘shoe-spikes’ with me. The view at the end point was marvellous and again a lot of pictures were taken. Back in the bus to Abisko we were getting already excited for our evening programme. We were going to enjoy a Swedish sauna, followed by… a jump in the lake. Yes, you’ve read it correctly. And yes, many of us didn’t think they would. And almost everyone did. Personally I totally loved rolling in the snow between coming out of the lake and running back to the sauna. What an experience! And then, around lunchtime of our fifth day, we were gathering in front of our bus for the last time. It was time to take that tremendously long trip back home. Actually, it was even a longer trip ahead of us compared to our way up North to Kiruna. Nobody looked much forward to it, but our tour guide tried to cheer us op with some new movies. The real entertainment came not from the movies though. We had been only a few hours on the go when one of the girls shouted she was seeing northern lights! Everybody was shouting and laughing and looking through the windows. It was beautiful, really big and moving a lot, plus we were able to see it several times. Now our trip was absolutely complete, and before we knew it we woke up again in rainy Uppsala. 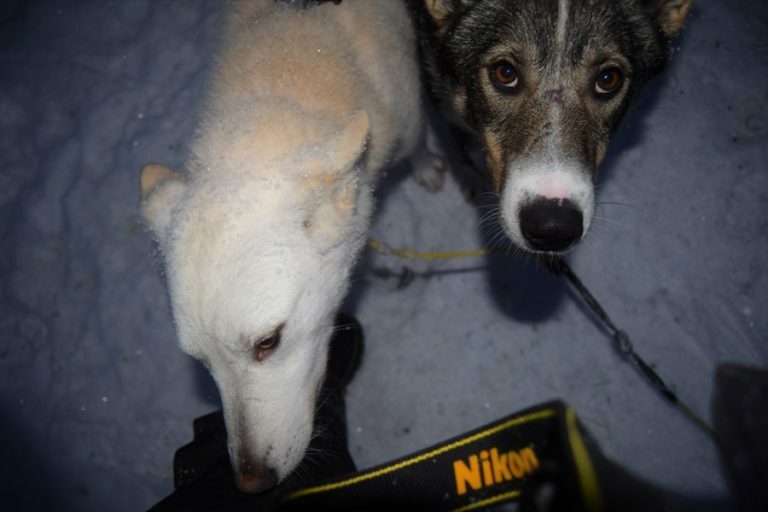 This post is a follow-up on Into the Arctic! (part 1). 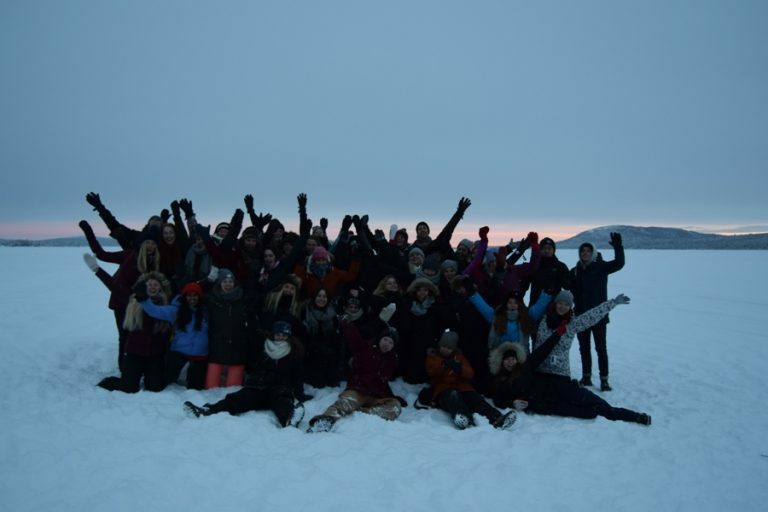 After a cosy evening in which our group got to know each other better, the next morning it was time to leave Kiruna and continue our journey already. The next destination for the night would be the National park of Abisko. 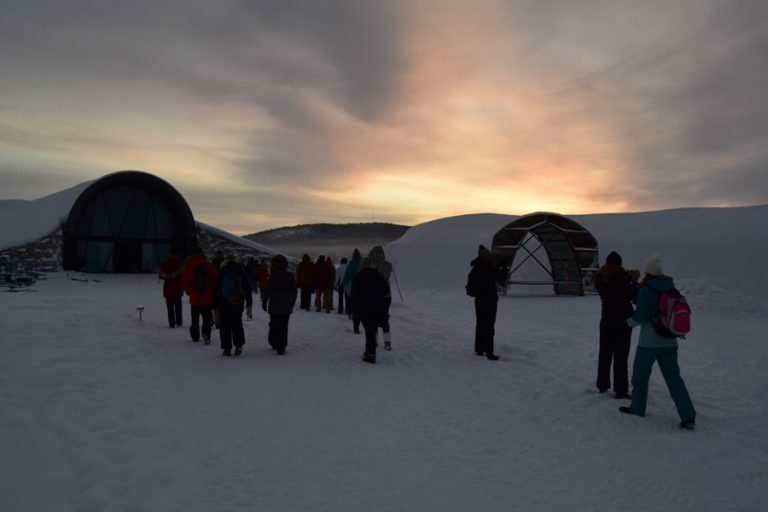 There were two activities planned for today; visiting the world’s first Ice-hotel and getting a glimpse of Sami culture. 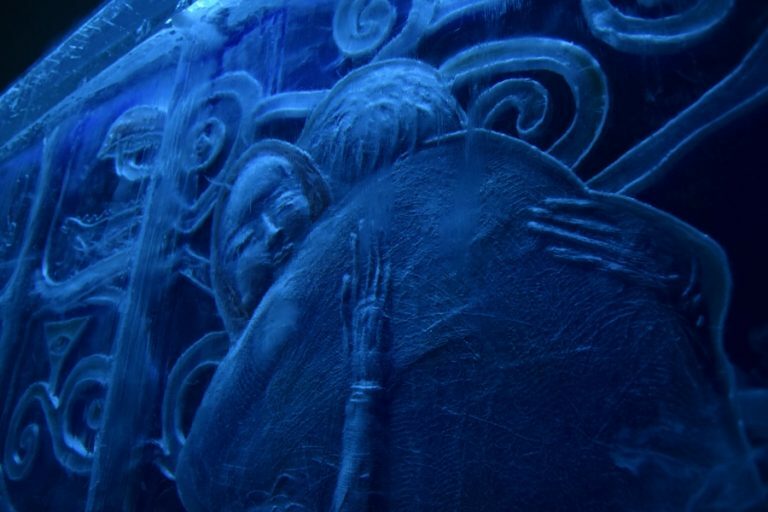 The history of the ice-hotel is kind of a funny story. It started with art exhibitions out of ice in a kind of igloo like building. One night, back in 1989, all rooms in the surrounding area were booked for the night and a group of visitors asked if they were allowed to sleep in the igloo. And they loved the experience! That’s how the ice-hotel was born. Since then the ice-hotel has been built newly for every winter season. Artists get permission to design and sculpt one room each, resulting in no room being the same in the hotel. The rooms are open to visitors as an art exhibition by day and rented out as bedrooms by night. It ain’t very cheap to sleep here.. but it’s definitely a very, very cool experience. However this year a new part of the hotel had just been opened when we arrived. The ice-hotel 365, which will be – surprisingly, haha – open for 365 days of the year. That does also include summer! This new, year round ice-experience will be powered by solar energy. After all, the sun never goes down here during summer. Kind of funny though, keeping ice from melting by the energy of sunlight. It was really exciting to see the ice-hotel. Beforehand I wasn’t to enthusiastic about going here, but when we walked through the beautiful sculptured rooms I was absolutely amazed by the artworks. After the ice-hotel we went to visit a Sami family. This was something I had been really looking forward to ever since I learned more about this indigenous people of Scandinavia. 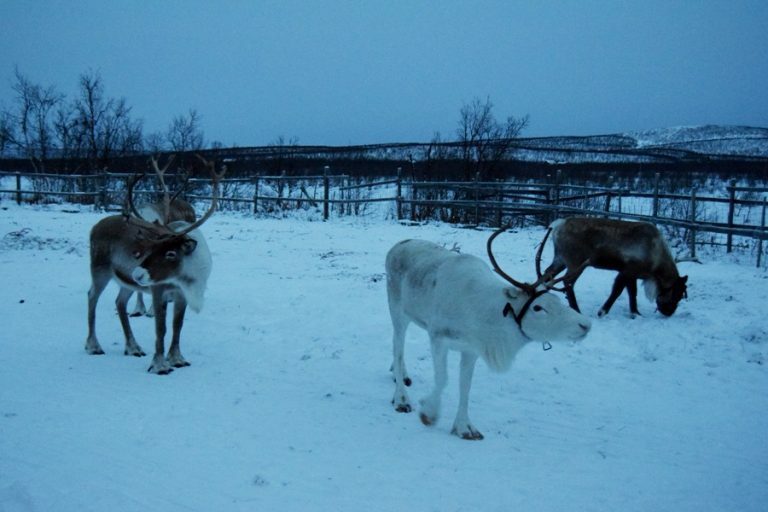 Also we knew we were going to meet reindeer here up close, so you can imagine that my animal scientist’s heart skipped a beat when we finally arrived. The two guys who were welcoming us turned out to be not only really friendly, but also quite direct and joking around – not like your average Swede. 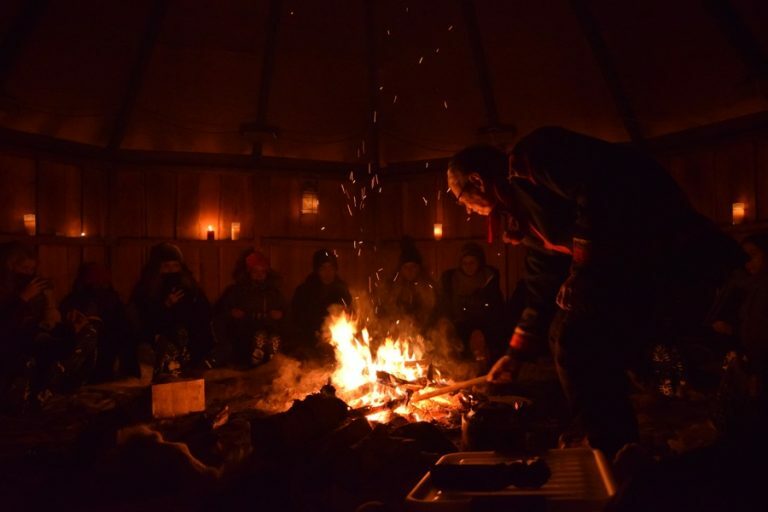 The group was split into two once again, and while half of us went feeding reindeer the other half followed into the tent to listen about Sami culture. Inside the tent it was smoky but cosy and it was nice to warm yourself around the fire. After all it was almost -20 degrees outside! The stories we heard were maybe not really what we expected but interesting either way. As one of the guy’s daughters recently got married we ended up talking a lot about marriage and the traditions around marriage in Sami communities. During the conversation we were served reindeer meat and some kind of reindeer broth. As I’ve been vegetarian for many years I kindly refused the offer. When I heard the others commenting they felt the drink tasted like ‘the smell of a wet dog’, I wasn’t too sad I had missed this. Outside the tent I had a lot of fun feeding the reindeer. They knew the trick and as soon as their owner came into the paddock with a big plastic bag some of them became very ‘cosy’. We could feed the reindeer from our hands which was a really lovely experience. You had to be careful though not to end up with one of the antlers in your eyes as they seemed to move around quite carelessly looking for more treats. Unfortunately we didn’t get to know many details about reindeer keeping, but I still enjoyed it heaps. That’s all for now. 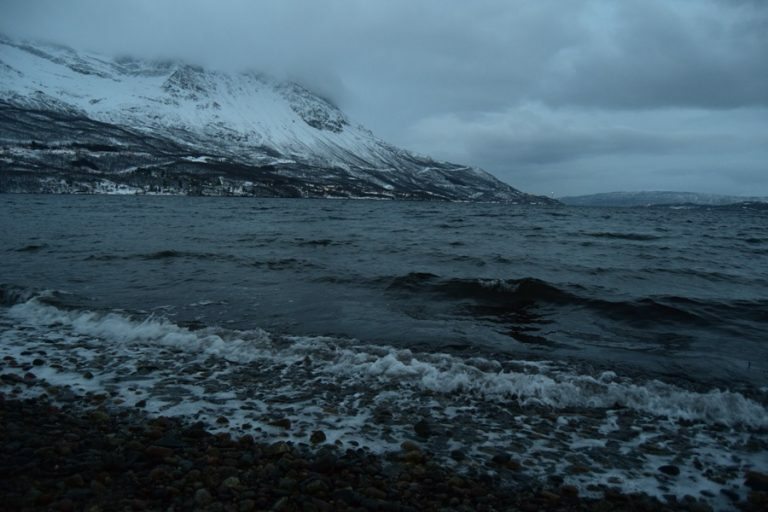 Next week I will write a final post about our amazing journey through Lapland, including a trip to the fjords of Norway! You can imagine the joy when we finally reached our first destination: Kiruna. This most Northern town of Sweden has quite a fascinating story. 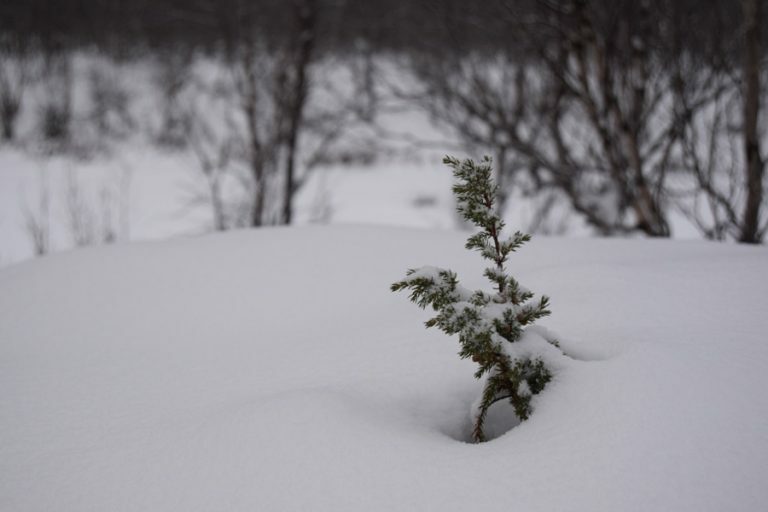 Kiruna is located nearby the World’s largest underground iron ore mine. This famous yet controversial mine seems to be responsible for both origin and destruction of the town. Though I think it should be mentioned that before the town was built these grounds were already part of Sápmi. As mining continues the ground at the surface deforms which will make large part of the town unsafe to live in the future. Therefore half of the town – including the city-centre – will be either moved or demolished in the coming years, a massive project. We started the day with a guided walking tour and visited the beautiful church and massive town hall. 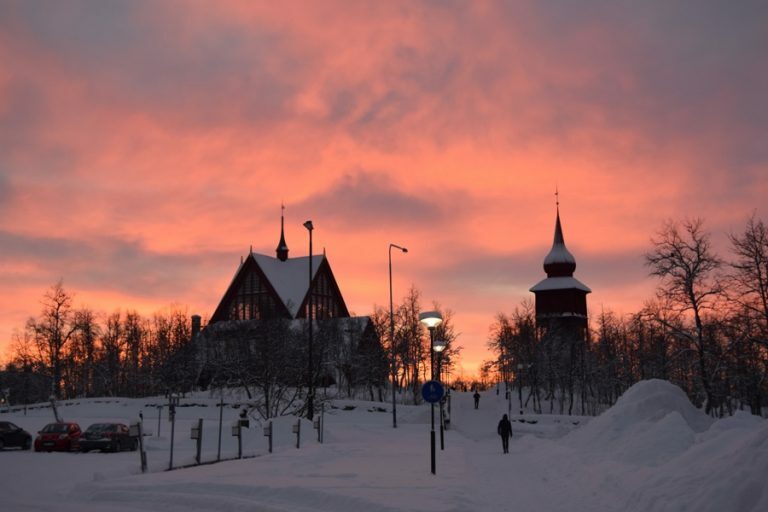 This church is one of Sweden’s largest wooden buildings and is open to any religion. Isn’t that a wonderful idea? The town hall seems a bit grey and industrial from the outside, but as soon as you walk inside this feeling changes rapidly. It is rather cosy, exactly what the architects intended, even though they based their design on the inside Alcatraz prison. Everybody got really excited as it was almost time for our second activity that day. 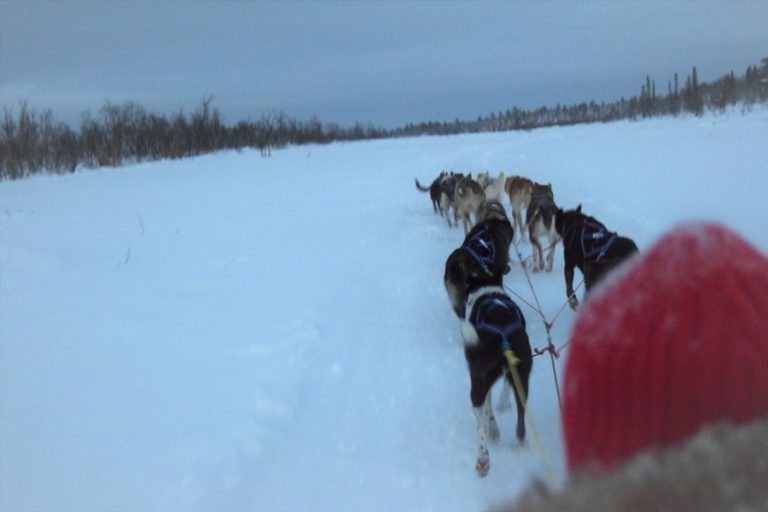 We were going dog sledding and driving snow mobiles! As we arrived a little early on the farm we had the opportunity to cuddle with husky puppies. No matter the cold, your heart just melted. Even though we were already wearing many, many layers we went to dress up with extra winter overalls before jumping on the snow mobiles. 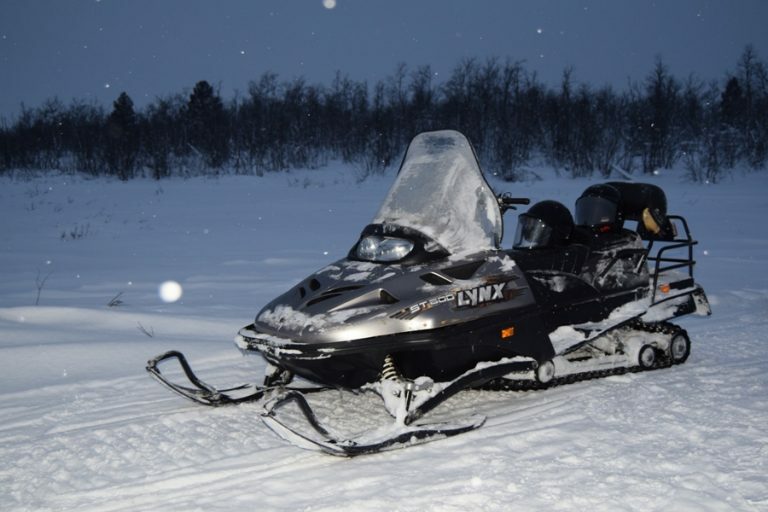 Driving the snowmobiles was so much fun, we kept shouting of joy while speeding through the snow. Halfway we had a break where we switched to the dog sledding after warming ourselves with tea and cake at a fireplace. To prevent these posts from becoming incredibly long, I decided to split the story into several parts. In the next post I will tell you all about the eccentric ice-hotel and delightful Sami people we visited. Imagine. It is Wednesday night and you go with your friends to the nations for a drink. Upon arrival you realise there’s a new face in the group so you introduce yourself. This itself can be already quite challenging, especially if the group is international – you may hear a name you’ve never heard before and seems impossible to pronounce. When I say my name is Rosan the reply will either be “Roxanne?” or “Rose?”, after which I try to explain it’s like ‘Rosa’ but with an additional ‘n’ in the end. Sometimes you also ask each other where you are from but it won’t be long before the topic changes to studies. I guess for some people this is a very easy question to answer. Imagine studying mathematics, history or English language… However, for people studying at SLU it is usually not that straight forward. I guess my programme is not as hard to explain as for example ‘Rural development and natural resource management‘, still sometimes I secretly wish I could just say I studied biology. After mentioning you are studying animal sciences, nine out of ten people will reply: “So you are studying to become a vet?”. No, I am not. I am hoping to graduate as an animal scientist! As most people are well aware of what a veterinarian does, I try to use this when explaining animal science. A vet will look at a sick animal and needs to recognise the disease and will try to cure the animal. As an animal scientist you look at an animal kept by people and try to find the best way to do it – how to prevent it from getting sick in the first place. What is the best way to house this animal, what is the optimal feed for it and how do we breed the next generation? Of course the fields of veterinary and animal science have some overlap, but I think this is a fundamental difference. There is also a lot in common with biology, though animal science focusses on animals kept in a human environment – mainly farm animals but occasionally also pets, horses and zoo animals. Back to the storyline of the nation pub. Because sometimes it happens that people are quite interested in what you explained about your studies. They they might ask this most difficult question: “What will you be when you graduate?”. Or in other words; what will you do for a living after you finished studying? The easy answer is saying studying animal science will lead to graduating as an animal scientist. This is not really clarifying though. Animal scientists kind of end up everywhere – you’ll find them working at universities, companies, governments and ngo’s. I absolutely appreciate animal science being such a broad programme with aspects of economics and social science, but when it comes to future jobs it is not very specific. Which is not necessarily a bad thing – you have a lot of opportunities. Please don’t get me wrong, I love my studies. Though there are days when I stand in the pub wishing I was studying to become a vet and my name was Roxanne. How easy life would be! The first day I visited our campus Ultuna, I fell in love with it. I remember it well, biking down along Fyrisån river through fields and forest and finally finding myself surrounded by houses again. Beautiful old houses. But when biking a little further I stumbled upon impressive modern buildings. 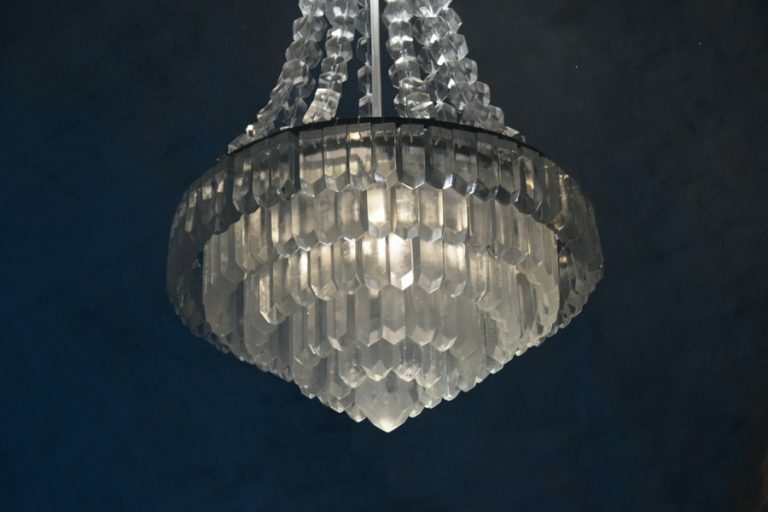 I don’t always like modern, but these were in their own way quite pretty. That first day I walked into Ulls hus – the main building – I noted the light, the space, the amazing use of wood and the funky furniture immediately. Talking to the receptionist I learned that this building had been taken into use just now, it had been finished over summer. part of the Biocentrum (left), Ulls hus (right) and a bus approaching. Not only Ulls hus is ‘new in town’. 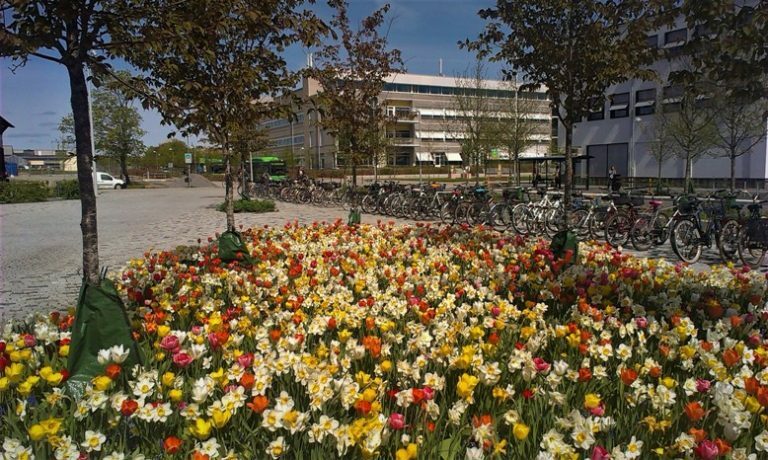 Recently Ultuna campus has grown a lot as a result of moving several departments and studies within SLU towards Uppsala. Other really stunning education buildings are the Biocentre and the MVM. One of the buildings I visit often as an animal science student is the ‘Veterinärmedicinskt och husdjursvetenskapligt centrum’, which everybody simply calls VHC. 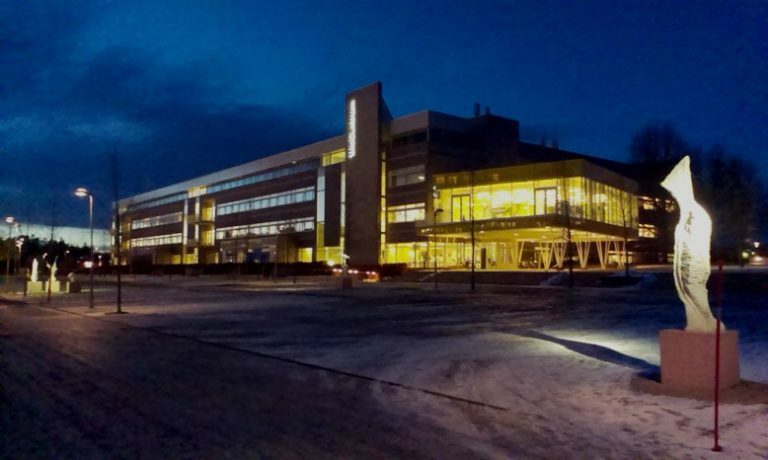 This building is not education and research only, it is directly connected with the university animal hospital. In practice this means that some days after class we walk straight into the veterinary clinic without leaving the building. However the passing through doors is strictly regulated so you’d better not forget your electronic keycard or you might find yourself waiting for a long time in front of some closed doors – I am telling you that from my own experience, ahum. Yes, Ultuna campus is definitely worth a visit. Whether you’re a student or not, there is a lot to see. There are some nice parks and there is a historical walk as the area used to be a Viking settlement in earlier times. If you’re into architecture make sure to visit during the opening hours so you can see the buildings from the inside as well. Curious already? Check out this article I found about the amazing woodwork within Ulls hus. Ultuna campus is easily accessible by public transport, but there are also excellent biking trails. Any questions or simply want to know more? Leave a reply below.